The term ‘stomach pressure’ is not a specific symptom. Instead it is a common term to describe a symptom where a person feels a pushing out sensation, abdominal fullness or bloating in the stomach. Since the term ‘stomach’ and ‘abdomen’ are often used interchangeably in lay terms, stomach pressure may therefore also refer to abdominal pressure. Strictly speaking, stomach pressure would refer to these sensations in the left upper abdominal quadrant. It is often difficult to isolate the sensation as being localized to the stomach itself since there are so many other organs and structures surrounding it in this quadrant. Usually the symptoms are believed to originate from the stomach when it occurs shortly after eating or drinking. It is not uncommon for most people to use several common and descriptive terms to describe a range of sensations. ‘Stomach pressure’ is one such example. Pressure could refer to a sensation of pushing in from the outside onto the stomach – a constricting type of sensation. Alternatively, and more commonly, it refers to a sensation of pushing out from the inside of the stomach which is similar to a sensation of fullness, bloating or a tight stomach feeling. Often these symptoms of different sensations either precede the onset of pain or occur in low-grade conditions where it is not severe enough to elicit pain. 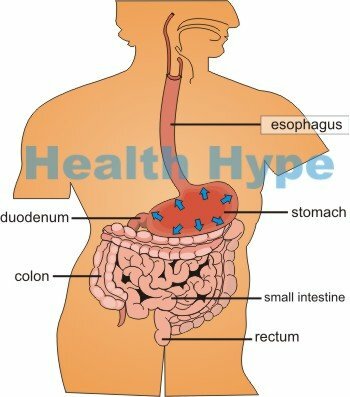 The stomach is a hollow sac that is capable of expanding significantly when filled with food or gas usually from air swallowing or carbonated beverages. It is usually these situations that cause distension and a sensation of stomach pressure where the stomach feels like it is pushing outwards. When empty the stomach collapses as it contains little more than a small quantity of mucus, acid and enzymes. Even pressure from surrounding organs are not perceived. However, a partially or completely filled stomach will experience a sensation of pushing inwards (constricting sensation) when there is pressure from outside of it, usually from surrounding abdominal organs. Most visceral sensations are usually not perceived unless it is intense or associated with damage of tissue as a result of disease. The term stomach pressure may not specifically refer to the stomach itself. Therefore it is important to take the surrounding organs and structures into consideration which may give rise to a sensation of stomach pressure. Many of the causes of stomach pressure have also been discussed under stomach bloating and even left side abdominal pain. Bile reflux is the backward flow of bile secreted from the gallbladder into the duodenum. It enters the stomach or as high up as the esophagus. Bile irritates the stomach and can cause a host of symptoms such as nausea, vomiting, heartburn and severe abdominal pain. Gastritis is inflammation of the stomach usually due to injury to the inner lining caused mainly be Helicobater pylori (H.pylori) stomach bacteria and use of medication like NSAIDs. It tends to present with a gnawing dull ache in the left upper quadrant, along with nausea, excessive belching and sometimes vomiting. In severe cases there may be bleeding with blood in the vomitus or stool. Gastroparesis is a condition where the stomach muscles are paralyzed. It slows down the churning of the food in the stomach and the pushing out of chyme into the duodenum. Hence the term delayed gastric emptying. The usual symptoms include nausea and vomiting, feeling of fullness after just a few bites of food, loss of appetite and weight loss. Hiatal hernia is where a portion of the stomach slips through through the opening in the diaphragm to protrude into the chest (thoracic) cavity. A stomach pressure sensation is common and pain is rare. It is worse with eating as the stomach expands and pushes upwards. Peptic ulcers are open sores that form in the wall of the stomach, duodenum (first part of the small intestine) or esophagus (food pipe). It is mainly associated with overproduction of stomach acid and failure of mechanisms to protect the wall of the gut from the acid. Stomach ulcers are usually a complication of gastritis. The symptoms are therefore similar and there is intense pain and loss of appetite. Tumors in the stomach may benign (non-cancerous) or malignant (cancerous). Stomach polyps are one of the mainly benign growths. Benign tumors are largely asymptomatic until it grows to a point where it causes an obstruction of the stomach outlet or compresses surrounding organs. Malignant tumors cause more serious symptoms like blood in the vomit or stool. weight loss and lack of appetite. Abdominal obesity can apply pressure to the stomach and other abdominal organs. It is usually worsened when lying flat on the back. Abdominal tumors, especially those arising from the outer surface of the abdominal organs in close proximity to the stomach, can also press against the stomach. Ascites is the accumulation of fluid in the abdominal cavity around the organs. It is largely asymptomatic until there is a significant accumulation of fluid within the cavity. Constipation where the accumulation of wastes in the colon causes distension of the transverse colon and splenic flexure. This can apply pressure on the stomach. Hepatomegaly is an enlargement of the liver which may place pressure on the distended stomach. As with splenomegaly, it is only a significant enlarged liver that will compress the distended stomach. Intestinal obstruction or bowel obstruction is where there is a partial or complete blockage in the small intestine or large intestine respectively. 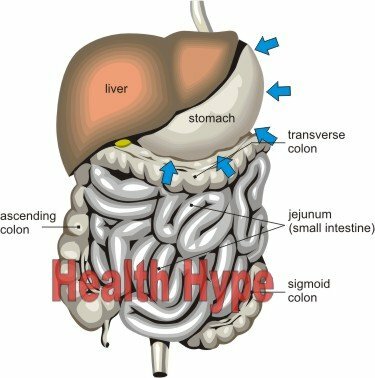 Apart from the backing up the intestinal contents, sometimes as high up as the stomach, the distended intestines may also compress on the stomach. Peritonitis is the inflammation of the peritoneal lining of the abdomen. Although it may not compress the stomach, the irritation of the peritoneum does sometimes cause a pressure sensation. Peritonitis is usually painful. Pregnancy is a common cause of increased abdominal pressure and the expanding uterus pushes against the bowels which in turn presses against the upper abdominal organs like the stomach. Splenomegaly is an abnormal enlargement of the spleen which sits right next to the stomach. Moderate and even massive splenomegaly does not place significant pressure on the stomach except during eating when the stomach distends.